Infused with hops, pumpkin seed and oatmeal extracts, Chassis Premium Powder is revolutionizing men's body powder. If you're ready to become a Chassis guy, also consider our other products, the 5-in-1 Shower Primer and Extreme Cream, both of which complement the Premium Powder. PREVENTS CHAFING-- High-performing men deserve high-performing powder. Treat your skin right with a high-grade men's body powder featuring Hydro-Shield technology that prevents painful chafing and friction while reducing sweat. ELIMINATES ODOR- Sweat equals smell. 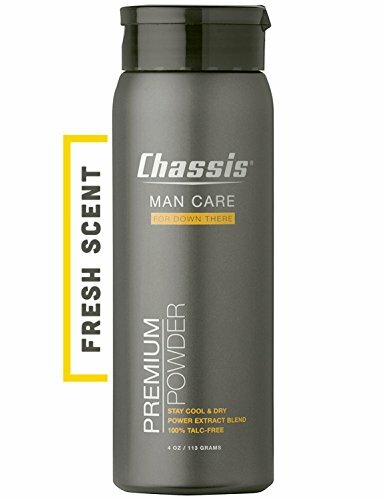 Chassis Premium Powder combats sweat and body odor to keep you feeling fresh all day. Featuring baking soda, it's a high-quality, natural deodorant for your private areas. TOP-QUALITY INGREDIENTS- Say goodbye to cheap drugstore powders forever. Chassis Premium Body Powder contains no talc, aluminum, parabens, or menthol. Instead, it uses baking soda, pumpkin seed, hops extract, oatmeal, and other natural ingredients. INCREDIBLE SCENT- Leave the baby powder for the babies and leave the medicated powder for the hospitals. Chassis smells clean and fresh to keep you confident no matter where the day may take you. Plus, it won't overpower your normal cologne or aftershave. LONG-LASTING- A little goes a long way: most men experience 3+ months of daily usage per bottle. A few shakes last all day, so you're protected, cool, and confident from morning to night. Want a greater cooling experience? Shake on some more! The more you apply, the more invigorating the cooling sensation. For the ultimate in cooling, consider purchasing Chassis Ice Premium Powder. If you have any questions about this product by Chassis, contact us by completing and submitting the form below. If you are looking for a specif part number, please include it with your message.